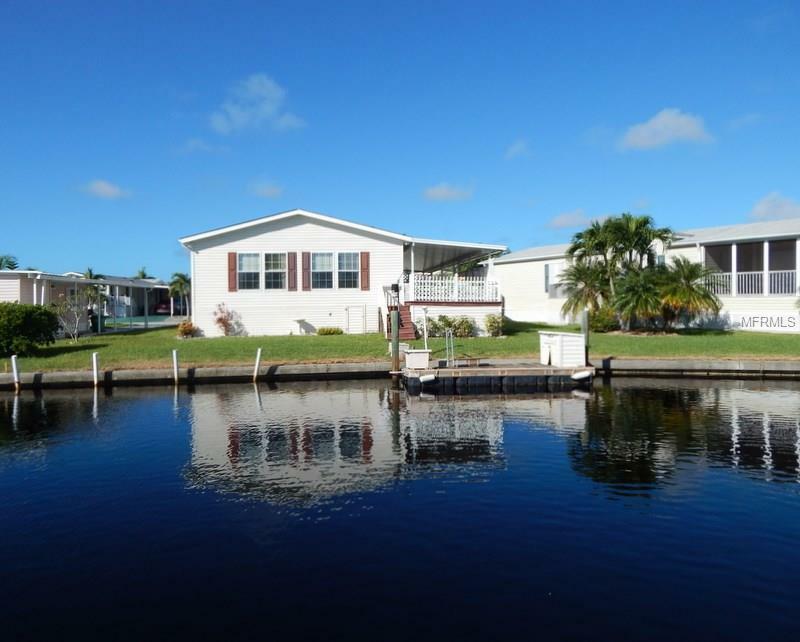 WATERFRONT with Gulf access home with a fabulous view of intersecting canals. You'll find generous room sizes and an open floor plan in this spacious 2 BR + den home. The bright kitchen has good work and storage space and opens to the living and dining room. Beautiful water views from each room. Sliding doors open from the dining room to the large open deck overlooking the water - - seller says this is her favorite spot. Enjoy the fresh Florida breeze as you watch the fish jump and the boats go by. Or hop on your own boat and take a trip to the Gulf. There is a floating dock, and room for a boat lift (must verify with permit). Upgrades include drywall throughout, crown molding, storm panels for sliding doors and front door. The master suite includes 2 large closets, dual sinks and step in shower. The den has French doors and is large and bright. A new metal roof has just been installed. Interior freshly painted! Windmill Village is a resident-owned park with salt water marina and sailboat access to the Gulf. Enjoy boating and kayaking clubs, bocce ball, a large heated pool and beautifully maintained tropical setting. The clubhouse offers a billiards room, library and grand hall for dinners, dances and entertainment. A great condo alternative! The low monthly fee of $189 covers lawn mowing, water & sewer and recreation facilities. Price does not include park share & bond buy-in of $20,285 (which is returned when you sell).